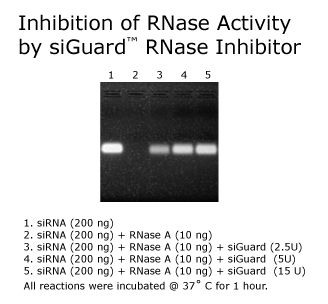 siGuard™ RNase Inhibitor is specially designed to prevent degradation of siRNA samples by RNase. It is non-toxic to cells and is proven to be effective for siRNA transfection (see figure below). When siGuard™ RNase Inhibitor is used as part of the siRNA transfection procedure, you are less likely have problems associated with RNase contamination. Each vial contains 100 units of siGuard™ RNase Inhibitor in 100µl solution. 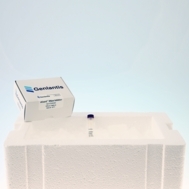 The siGuard™ RNase Inhibitor is shipped frozen and should be stored at -20ºC upon receipt. If stored properly, all components are stable for 6 months.